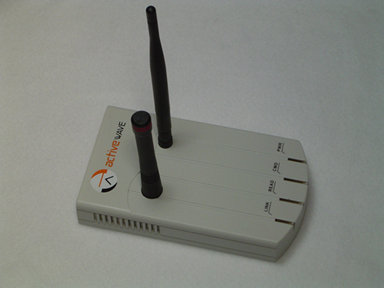 The ActiveWave Standard Reader interfaces the Host computer to the RF side of the ActiveWave RFID system. The Standard Reader receives all RFID data transmitted by a tag. It deciphers this data and sends the information in real-time to the Host. Depending on the application, the Host can use this information to control access to restricted areas, track assets through a facility, or update inventory counts in a warehouse. Along with the rest of our products, the Standard Reader was designed for easy setup, configuration, and use. When the Reader is turned on, it automatically sends a power-up message to the Host software. If using RS-232 communications, the Host will immediately display the Reader's address and allow the user to change it. If using Ethernet (802.3) or WLAN (802.11), a simple network search by the Host will identify all available ActiveWave Readers. The user can choose which of these Readers, or all Readers, to interface to the Host simultaneously. Colorful LEDs on the front conveniently indicate the Reader's operation at all times. When configured as a Field Generator, this Reader can call tags periodically or when activated by a motion sensor. Two input contacts and two output relays on the Standard Reader allow the user greater control over the entire system. Input devices such as door sense inputs and request to exit contacts can communicate directly through the Reader to the Host. Output peripherals such as electric door strikes, magnetic locks, CCTV, lights, and sirens can all be controlled automatically by the system. Doors can be unlocked immediately for valid tags and securely locked for unauthorized tags. Two RF frequencies are used by the Reader to communicate to the system. The Reader transmits tag data using one frequency, and receives tag data using another frequency. This dual-frequency method allows for fast and reliable full-duplex communications.